Viruses that replicate in the male or female reproductive tract are considered to be potential causes of human infertility. Several herpesviruses have been implicated in male infertility, and now human herpesvirus 6A (HHV-6A) has been found in endometrial cells of women with unexplained infertility (paper link). 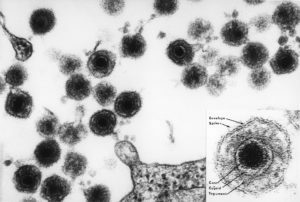 HHV-6 was only recently discovered (1986) and is now known to occur as two variants, HHV-6A and HHV-6B. The latter is a major cause of exanthem subitum, a rash of infants, but no disease has been clearly associated with HHV-6A. These viruses are transmitted to infants early in life via saliva, from mother to child, from siblings, or from other infants at day care centers. Seroprevalence studies indicate that almost all children are infected with these viruses by 2 years of age. To determine if HHV-6 might be a cause of infertility, a study (paper link) was conducted of 30 women with unexplained primary fertility, and 36 women with at least one previous pregnancy. HHV-6B DNA was detected in PBMC from both infertile and fertile groups (25 and 28%, respectively); HHV-6A DNA was not detected. In contrast, endometrial epithelial cells from 13/30 (43%) infertile women were positive for HHV-6A DNA; this viral DNA was not detected in endometrium of fertile women. When placed in culture, endometrial epithelial cells produced viral early and late proteins, suggesting the presence of infectious virus. Presence of HHV-6A DNA in endometrial epithelial cells was also associated with an altered hormonal and immune environment. Estradiol levels were higher in infected versus uninfected infertile women. The authors suggest that higher levels of this hormone could be involved in allowing HHV-6A infection of the endometrium. Levels of a specific type of uterine NK cell were lower in HHV-6A positive women, and IL-10 (a Th2 cytokine) was elevated while IFN-gamma (a Th1 cytokine) was decreased. There were no differences in the levels of these cells and cytokines in peripheral blood. These changes are consistent with an increase in the ratio of Th1/Th2 responses that has been documented in female infertility. The authors also observed enhanced endometrial NK cell responses to HHV-6A in infected but not uninfected women, together with an increase in the number of these cells that are activated when cultured with HHV-6A infected cells. I wonder what was the source of HHV-6A in the endometrium, as the virus was not detected in blood. Was the infection recently acquired, or did it occur years before, with the virus establishing a chronic infection in the uterus? The results suggest that HHV-6A infection of the endometrium triggers an abnormal NK cell and cytokine profile, which in turn leads to a uterine environment that is not compatible with fertility. The results need to be confirmed with studies of additional fertile and infertile women. It would also be useful to have an animal model of HHV-6A infection of the endometrium, which could lead to mechanistic work to determine how virus infection causes infertility.